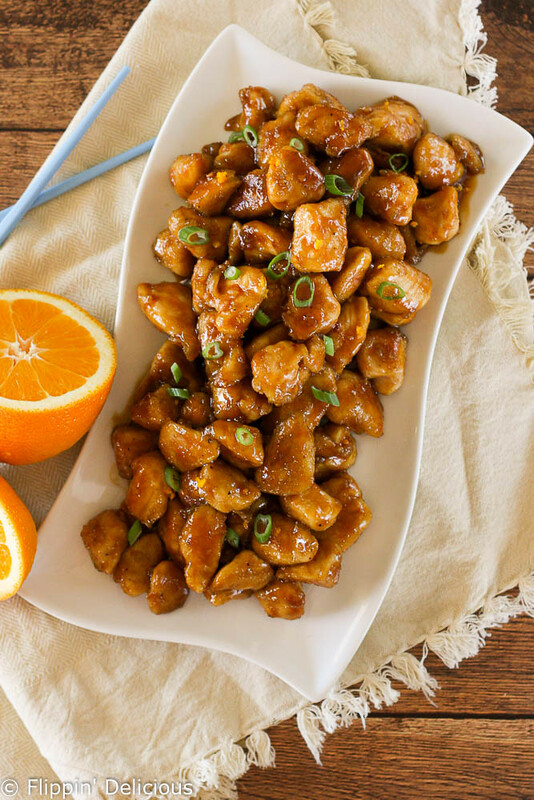 Easy Copycat Panda Express gluten free orange chicken tastes just like your favorite Chinese take-out! I think that we all have our favorite Chinese take-out. It is fairly easy to convert many Chinese take-out recipes to be gluten free. Often all you need to do is substitute the regular soy sauce for a gluten free tamari soy sauce or coconut aminos. Not all Asian recipes are so easy to make gluten free. The recipes that are breaded, like orange chicken, are not so always so simple to convert to gluten free. I’ve seen some gluten free orange chicken recipes that are prepared low carb style, just made without any breading. That is a simple solution, but I really like the extra chew and crispness that you get with breaded gluten free orange chicken. The breading on the gluten free orange chicken also helps the chicken to hold on to more of the sweet, tangy orange citrus sauce. Which of course, you want that mouthwatering sauce! Want to know the simple solution? You probably already have it in your kitchen. How do you use cornstarch to bread chicken? Cornstarch is often used as a thickener in Asian-style sauces so it is very natural to use to as a coating on the chicken. Depending on how thick of a breading you want on your gluten free chicken, you can coat your cut chicken pieces once or twice in cornstarch. How to lightly coat chicken pieces in cornstarch? I usually coat my chicken in cornstarch one time to make it a quick and easy weeknight dinner. First, place cornstarch in a large bowl, or a plastic bag. Cut your chicken into bite-size pieces that are 1-2 inches. Add the chicken to the bowl or bag with cornstarch, and toss to coat evenly. How to bread chicken pieces using cornstarch and milk or egg? If you want a thicker coating on your gluten free orange chicken just coat it twice. After you toss the bite-size chicken pieces in cornstarch (as described above) dip each piece in a little milk or an egg white whisked with a little water. Then toss dip your gluten free breaded chicken in another ½ cup of cornstarch. You may also try using cassava flour, which is the whole cassava root and not just the starch (just the starch is tapioca starch). You can also toss your chicken in a gluten free flour, but it doesn’t make the same light and crisp coating. I much prefer using a starch. 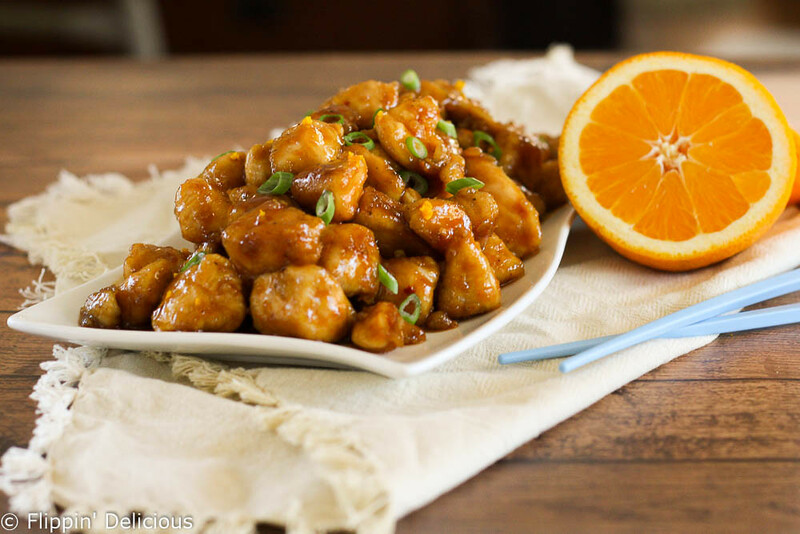 How to fry gluten free orange chicken? Another secret to the perfect golden crisp gluten free orange chicken is to make sure that your pan is sizzling hot before you add the chicken. To prevent catching my kitchen on fire I heat the pan up dry until a drop of water fizzles away seconds after landing on the hot surface. Then I add just enough oil to coat the bottom of the pan, and then add the chicken. I like using a cast-iron skillet because it has such great even heat. I also love using a non-stick pan because then I can use less oil. Don’t use a lid to prevent oil spatter. The lid will hold in the moisture the chicken releases as it cooks and you’ll have soggy chicken. And future you will thank yourself because you’ll have less clean-up to do. You want to cook your cornstarch-breaded chicken pieces in a single layer, with room in-between each piece so that they can get golden brown. If your breaded chicken is too close together, they will get soggy instead of crisp. I almost always cook my orange chicken in batches so my pan doesn’t get crowded. Be sure to add a little more oil for each batch of chicken you add. After all of the chicken is cooked, cook the sauce and then add the chicken back to the pan. 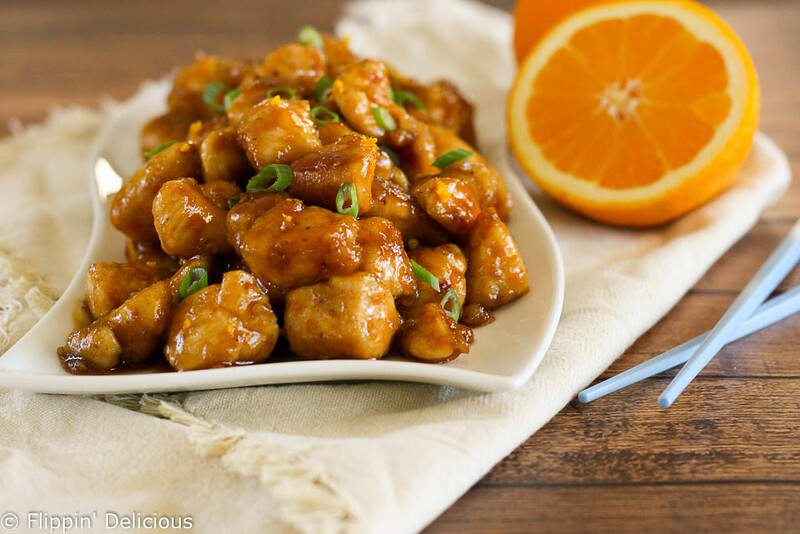 How do you make gluten free orange chicken sauce? Making the gluten free sauce for your copy cat panda express orange chicken is as easy as whisking the ingredients together in a bowl and simmering it until thickened. This sauce is so good, you may want to double it. 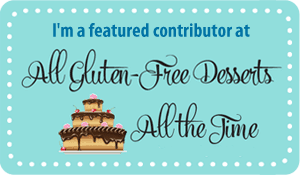 As written, it makes just enough to coat all of the breaded gluten free chicken. One of my blogging friends, MiGluten-Free Gal, makes my GF orange chicken more often than I do. She always doubles the amount of sauce for the recipe. I usually do the same! Gluten Free Soy Sauce. I usually use Tamari, but I’ve also used Coconut Aminos in this recipe with similar results. White vinegar. You can use either a distilled white vinegar, or a rice vinegar. I’ve even used apple cider vinegar in a pinch! Orange juice and orange zest. This is where you get all the flavor! If you don’t have a fresh orange to use for orange zest, it will still taste good but won’t have as strong of an orange flavor. Water. The sauce will be to strong if you don’t add it. Brown Sugar. Brown sugar adds sweetness, and also helps to thicken the sauce as the sugars caramelize. I’ve also made this recipe using coconut sugar and/or honey if you want a less processed alternative. If you don’t have brown sugar, you can use granulated white sugar. It won’t add as much flavor, but will get the job done. Minced garlic. You can use pressed garlic, or even garlic powder in a pinch. Red pepper flakes. You can use more or less to suit your tastes. If you are making it for particularly picky children you can omit all-together. If you don’t have red pepper flakes, you can substitute a tiny pinch of cayenne. Whisk all the ingredients together in a small bowl (I usually use a cereal bowl and a fork) and pour into the hot pan after you finish cooking the chicken. There will be just a little cornstarch leftover in the pan. The cornstarch will help thicken the gluten free orange sauce. If you want to make this sauce on its own, without the chicken, I’d recommend adding a teaspoon of cornstarch before heating it to help it thicken. Once the sauce is simmering, add the cooked cornstarch breaded chicken and toss to coat. Continue to simmer for another minute or two, the sauce will thicken up a bit more and will thicken even more as it cools. How do I garnish gluten free orange chicken? If I garnish my gluten free orange chicken, I usually sprinkle with a few thinly sliced green onions, or a sprinkle of sesame seeds. My mom regularly makes this recipe, and she adds thinly sliced carrots which add a great sweetness and contrasting texture. After cooking the chicken, but before cooking the sauce, she sautés thinly sliced carrots (so thin, they are almost shaved) in a little oil until they are golden on the edges. Then she adds the sauce to the carrots, and continues the recipe as written from that point. I think this recipe would also be great with some steamed green beans. 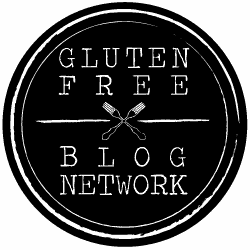 What can I serve with gluten free orange chicken? I usually go simple, and serve my orange chicken with rice. If you want to, you can even make your own parboiled rice to get dinner on the table even quicker. You can also serve it over gluten free rice ramen. I love making a copycat Panda Express Chow Mein by sautéing cooked rice ramen with sautéed onions and cabbage in a little sesame oil, and then seasoning with soy sauce. 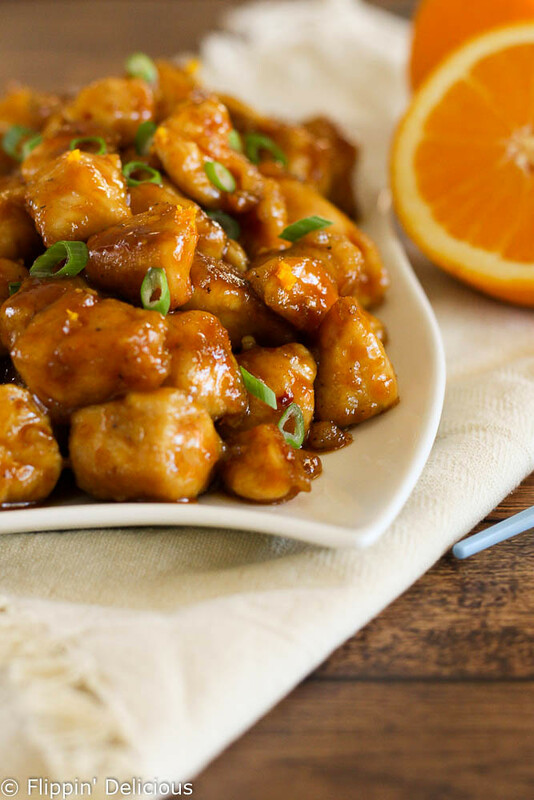 So here you go, a gluten free orange chicken recipe that is so easy and delicious that you’ll never miss Chinese take-out again. I think it tastes even better than Panda Express’ orange chicken. That is the power of the orange zest! Now all you need are some gluten-free fortune cookies and your meal is complete. If you are looking for a paleo-friendly take-out copycat recipe I think you’ll love my friend Taylor (of Food, Faith, Fitness)’s Firecracker Pineapple Chicken recipe. This looks amazing!! So glad I found the recipe at the #HomeMattersParty. Pinned it to try one night! I hope that you and your family enjoy it Jamie! My husband and son were just talking about having Orange Chicken not 10 minutes ago. Now I can make it up for dinner. Thanks Audrey! I hope you and your family enjoy it! Just wanted to let you know that this post was picked as a highlight on the #HomeMattersParty this week. Make sure to check it out at https://adventuresfrugalmom.com/home-matters-linky-party-55/. I hope you will come back and link up again. Hi, do you use all the corn starch for the chicken?, or do you save 1 tbsp for the sauce?. The recipe calls for 1/2 cup + 1 tbsp divided. Hi Thelma, I apologize for the confusion. The additional 1 Tbs is for the sauce. Happy Cooking! Watch out for modified cornstarch if you’re eating gluten free for necessity. Hello! Late to the game but I made this tonight with my 11 year old “little brother” who requested orange chicken. He’s never really cooked before but we made this together and it was amazing. We added extra orange zest because he had fun zesting oranges. And we served it with steamed broccoli. Amazing!!! I think the key is to cook the coated chicken without stirring or moving it much so it gets really crispy and then flip it. Thanks!!! Hi Kim, So happy you enjoyed my gluten free orange chicken. I will also add extra orange zest sometimes. And yes, it is important to let the chicken cook without moving around a lot so that the proteins can caramelize and get crisp. I can’t wait for you to try more of my recipes! I’m only seeing instructions up until step 3. Do I just combine the sauce ingredients in a bowl or does it need to be heated? Hi Celeste, There are more directions, the sauce does need to be heated. Depending on your device, you may need to scroll down within the recipe itself. It shows up in an iframe that changes size based on the size of your screen. There should be a small scroll bar on the right hand side of the recipe card. Hope you enjoy my gluten free orange chicken. The oil is for cooking the chicken. You just need enough to coat the bottom of the pan, which can be up to 1/4 cup depending on your pan and how many batches you divide your chicken into. Sorry for the confusion! Yes that is correct. You aren’t battering and deep frying the chicken. Instead you are adding a very light breading (the cornstarch) and then pan frying it with less oil. Doing it this way makes for a easier meal, that can even be made on a busy weeknight. I can’t wait to try this. I think something is wrong with the print button on your recipe. When I click print, it just opens up new window of this same thing. I can just look at the recipe on my computer, but I wanted to let you know. Hi Heidi, I just edited my response to you. The print button will pull up a printable version of just the recipe, the page just has to fully load and it takes a while. I’m still working with Food Fanatic to see if there is a way to speed it up. I wanted to comment again, so that you’d get the notification.